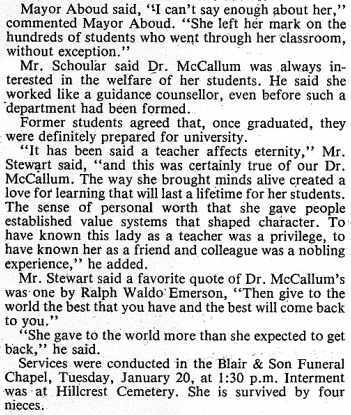 "It has been said a teacher affects eternity, and this was certainly true of our Dr. McCallum. The way she brought minds alive created a love for learning that will last a lifetime for her students. The sense of personal worth that she gave people established value systems that shaped character. To have known this lady as a teacher was a privilege, to have known her as a friend and colleague was a nobling experience." We need to retrace a few steps to define our family relationship with Mary McCallum. Our common root begins with Joseph Weekes and Jane Fullerton who came to Canada from Ireland in about 1839. Edward Fullerton Weekes was the oldest of the children who came with them, and one of the younger was James. James lived with Joseph and Jane where they settled in Port Elmsley and eventually took over the farm there. He married Annie Smith and they had twelve kids in total, the sixth of whom was Charlotte. 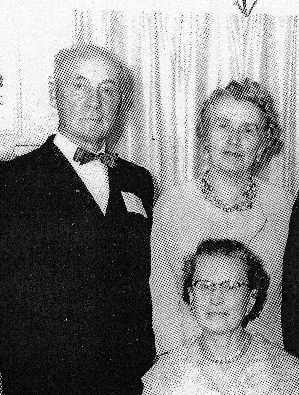 Charlotte Weekes married John McCallum, and they had two daughters, Hilda and Mary. Mary, at least, was born in Port Elmsley. 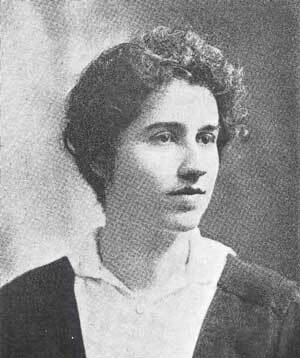 Mary grew up in Smiths Falls, started University in Toronto and completed her BA at Queen's University in 1916. 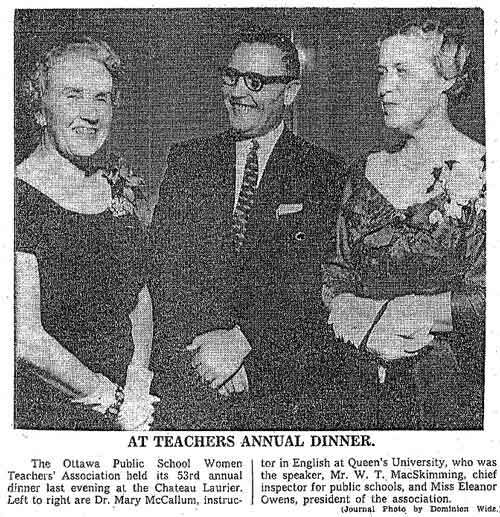 She taught English and History in high schools from 1916 until 1954 (in Barrie, St. Catherines and primarily Smiths Falls.) 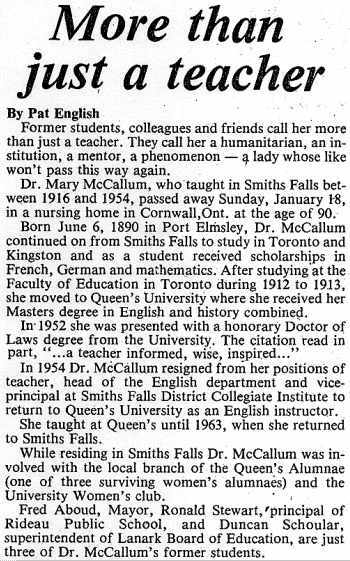 She was Head of the English and History Departments for 30 years in Smiths Falls as well as Vice Principal of SFDCI from 1947 to 1954. 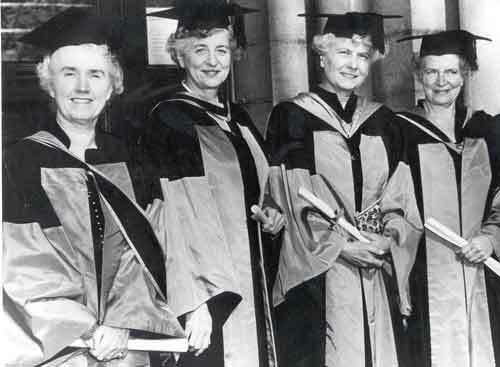 In 1929 she earned her MA from Queen's and in 1952 she was awarded an Honourary Doctorate in recognition of her gifts. In the address that accompanied the Degree presentation she was referred to as "a teacher informed, wise and inspired." In 1954 she resigned as a high school teacher and was invited to lecture at Queen's, which she did until 1963. 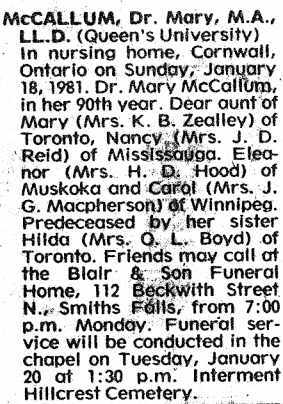 By 1977 she was living at Bestview Lodge in Cornwall, and she passed away in Cornwall in 1981 at the age of 90. Hers was a life well lived. With the help of the Queen's University archivists we have obtained a number of documents relating to Mary McCallum. They are included below. 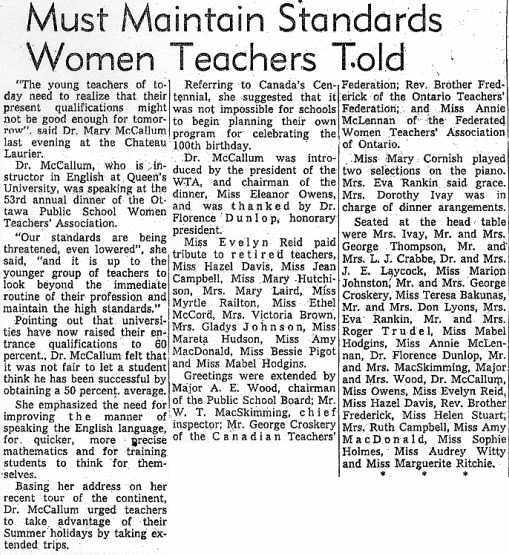 "Mary McCallum was one of the best and most dedicated teachers I have known. She did, indeed, have a major impact on my going on to University, and I stayed in contact with her for many years after. As you know, she was highly respected by many people at Queen's. I don't believe there are many high school teachers who have received Honourary Degrees from Canadian Universities. The award was no doubt given in recognition of her major contribution to the academic and personal lives of the numerous students who benefited from her inspiration and wise guidance. 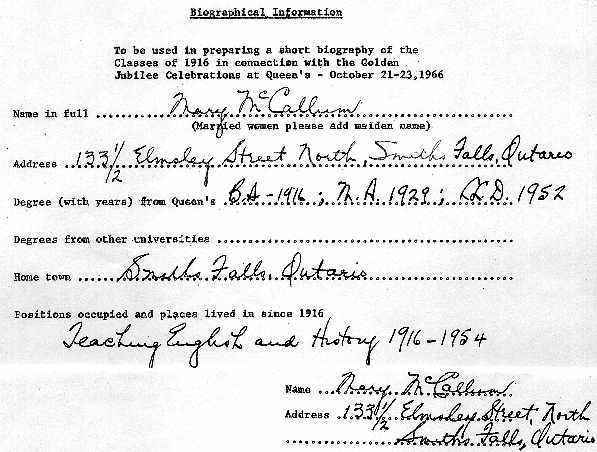 She comes to us from Smiths Falls, whose Collegiate Institute admirably fitted for her later work at Queen's and sent her forth with the Forbes-McHardy Scholarship in Mathematics, French and German. The Faculty of Education in Toronto claimed her for a year, but the call of Queen's was too strong to be resisted and she joined the Sophomore class in the fall of '13. During her three years with us, Mary has been an active worker for her year and has contributed pleasing numbers on many of our programmes. She possesses that rare faculty, too, of combining work and pleasure in proper proportions, and although there is no lack of fun and frolic for her during the session, there is also no dearth of "first divisions" in the spring. Soft smiles, by human kindness bred."